Winks & Daisies: Purple Carrots? I had no clue! I've seen and eaten orange and yellow but, purple? I came across this site and was drawn to it not only because of the discovery of there being purple carrots but, how fun and cheerful their labeling is. Right down to the colors and the shape of the bottles. The contents is equally as wonderful. Organic, less sugar, and packed with nutrients. 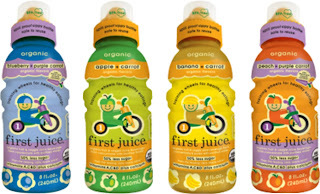 If you have young kiddos everything about First Juice is worth checking out.